How to configure modem router to work with IPTV (self-developed UI)? Note:This article applies to TD-W8968 V1, if it’s V2,please click here. We will take TD-W8968 V1 as example in this article.The steps are the same for other listed models. Before starting the configurations on TD-W8968, users have to know the IPTV related parameters from ISP. This guide is NOT suitable for the IPTV Application which requires Vlan-binding or some other special settings needed other than the below example shows. Also, we will configure LAN4 as an IPTV port. Step 1: Add Bridge Interface for IPTV. Go to Network->WAN Settings; add a Bridge interface for IPTV. Note: Up to eight WAN Interfaces can be added. If you fail to add a new bridge, you may have to delete the unused interfaces (or delete the one that use the same VPI/VCI) then do it again. 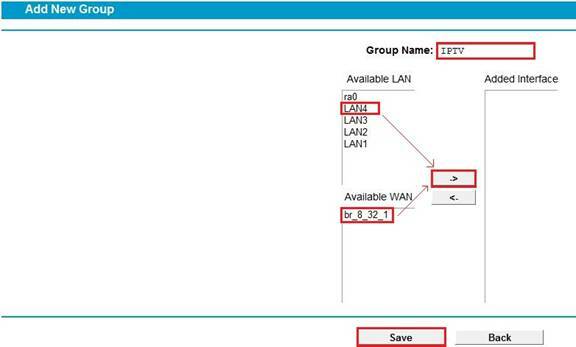 Fill in the information: VPI=8, VCI=32, Choose WAN Connecion Type as “Bridge”. For advanced settings, click “Advance” on the right side. 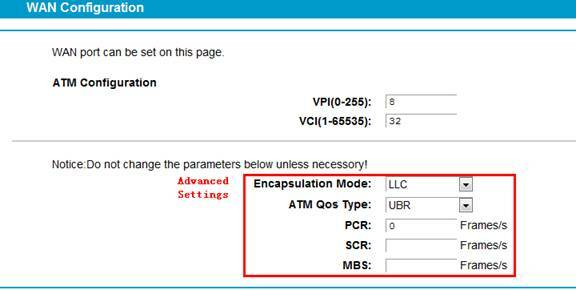 Then you can configure the Encapsulation mode and ATM QoS Type etc. Name the Group as “IPTV”, then add LAN4 and br_8_32_1 to the same group. Save it. After save, you will see a new IPTV group added. It has br_8_32_1 as WAN and LAN4 as LAN. Go to DHCP Server->DHCP Settings, Edit the IPTV Group and disable DHCP. Save it and IPTV Group’s DHCP status becomes disabled.